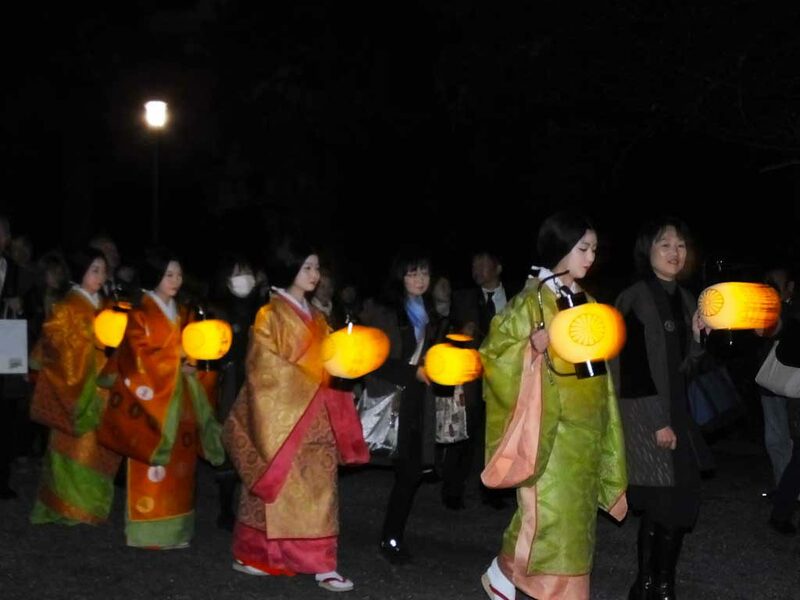 Inoko Festival is a Shinto ritual of Go-o Shrine that is annually held on November 1st. 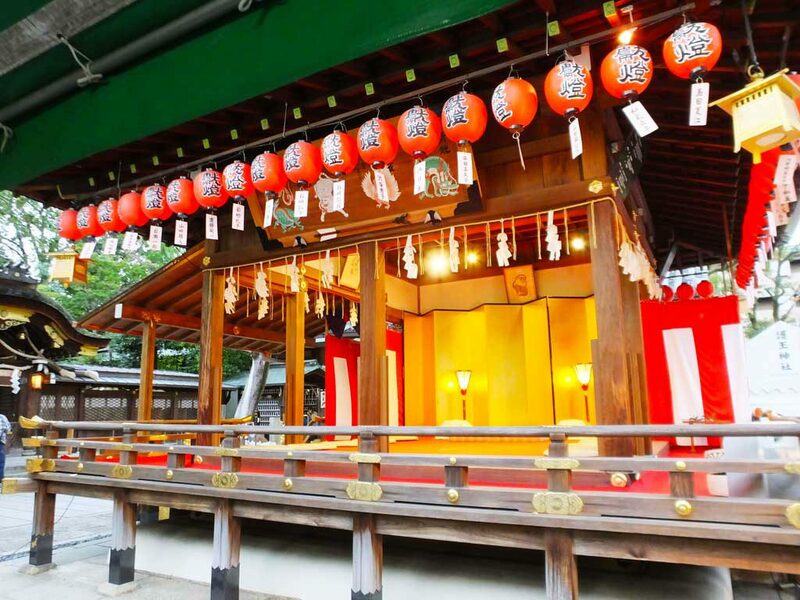 Go-o Shrine is situated just across Karasuma Street from Kyoto Imperial Palace. 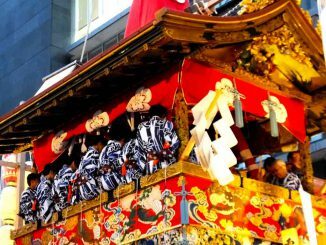 The shrine is a guardian deity of the palace, and Inoko Festival is held to recreate the palace’s annual ritual, Gencho no Shiki that was seen during the Heian Period (794-1185). 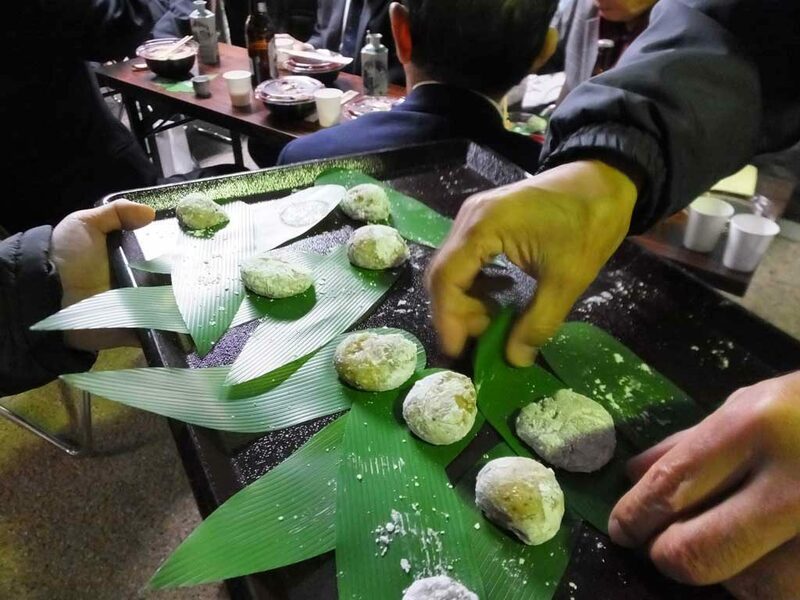 In Gencho no Shiki, people ate rice cake made by the emperor and pray for the state of perfect health and the prosperity of descendants. I went to the festival. 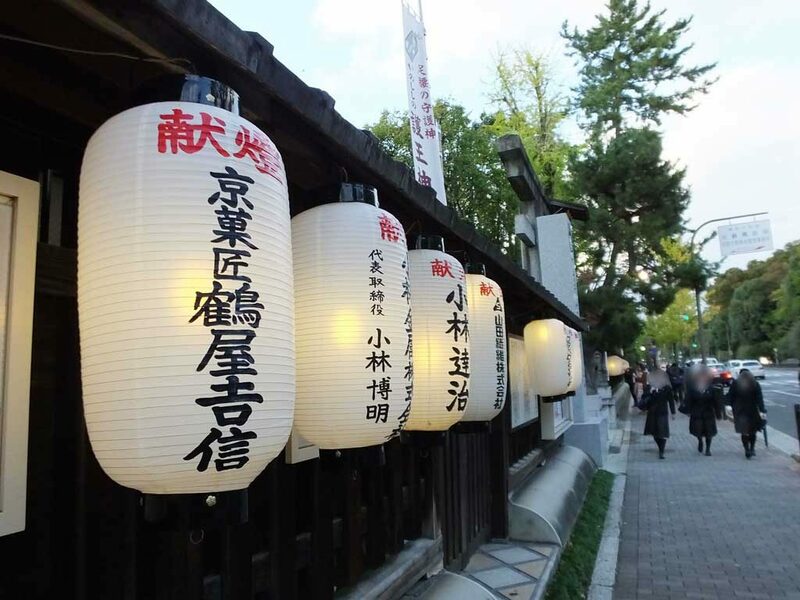 I arrived at Go-o Shrine around 4:00 p.m. and found many lanterns hanging around the shrine. I felt it was such a special day. Usually in a Shinto shrine you can see a pair of imaginary creatures called komainu. Instead, I was welcomed by boars in front of the torii gate. 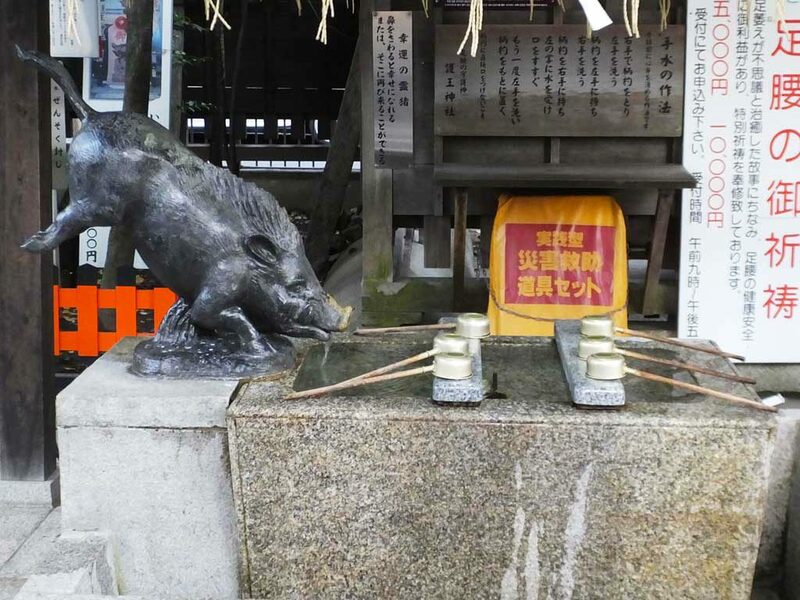 Actually, Go-o Shrine is well known as a shrine of boars. Rub the nose of the boar at the washbasin, and maybe you will have a good luck. 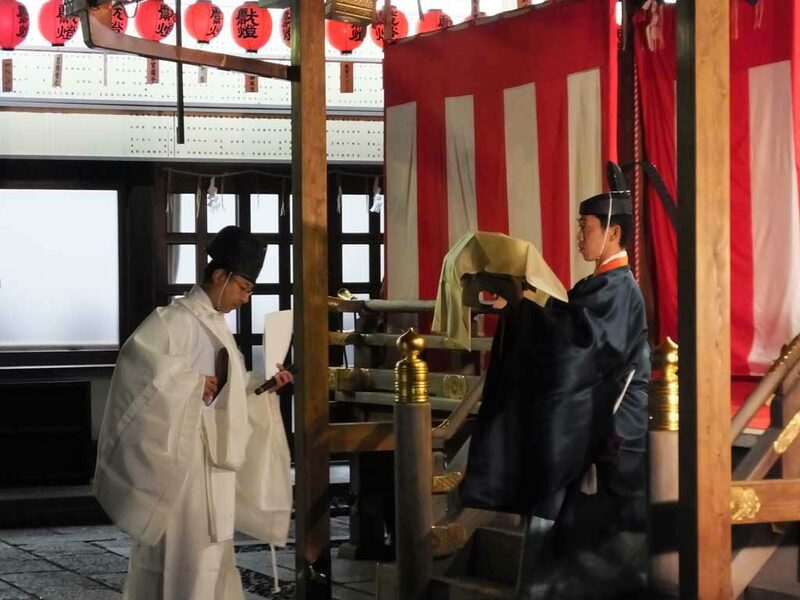 Also it is believed that if you worship at this shrine, you will get stronger lower back and legs. 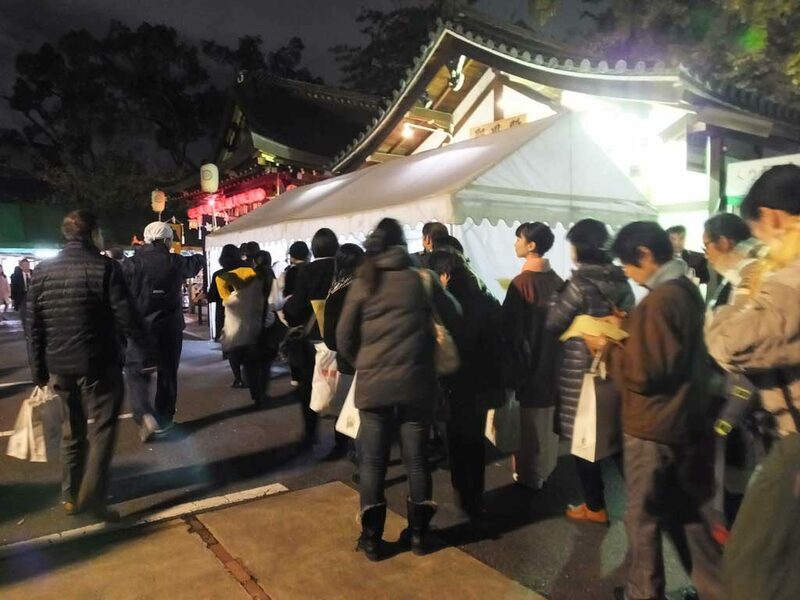 There were already some people in the shrine. 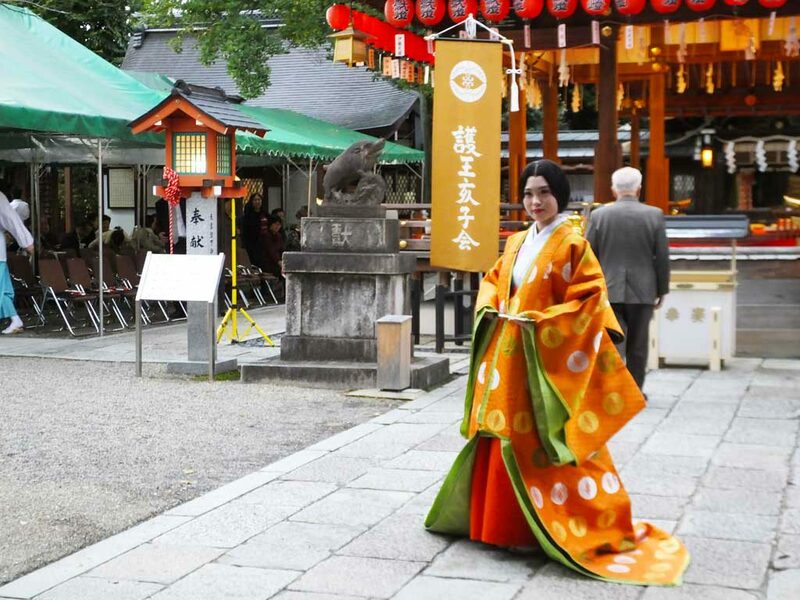 A woman called hoshi-nyobo was standing for a picture in front of the ceremonial dance pavilion called maiden. 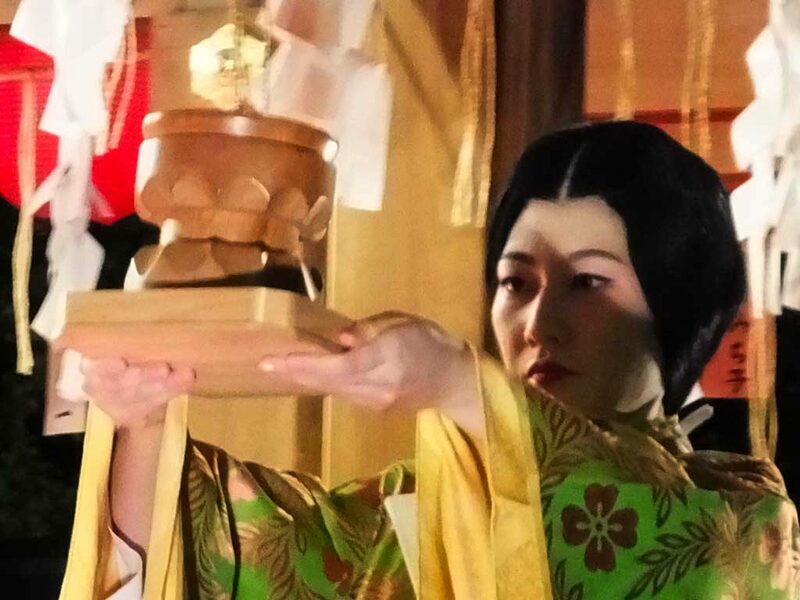 I saw people of the shrine and hoshi-nyobo including her rinsing their hands and mouths before the ritual started. 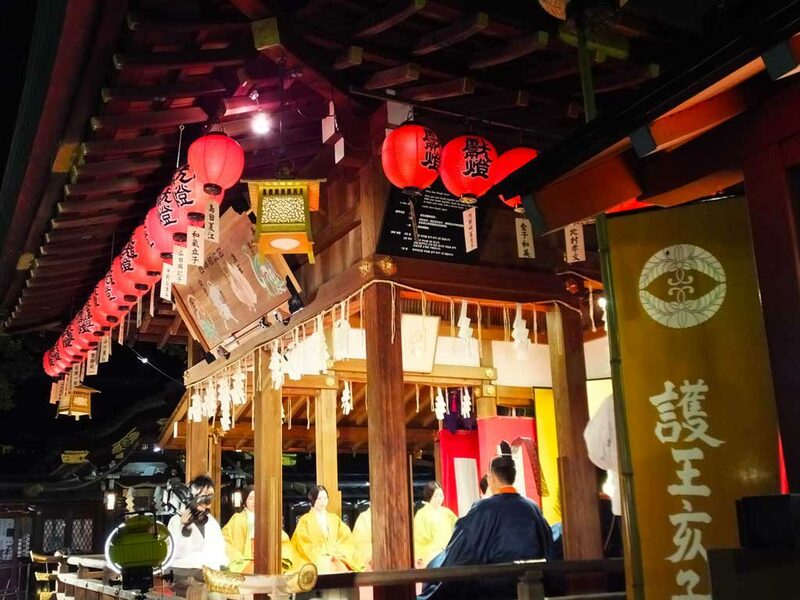 Before the main ritual called Otsuki no Gi takes place, a small ritual in which a Shinto prayer is recited is held at the main sanctuary at 5:00 p.m. Only authorized people are allowed to enter the area, but visitors are able to watch it on the screen. 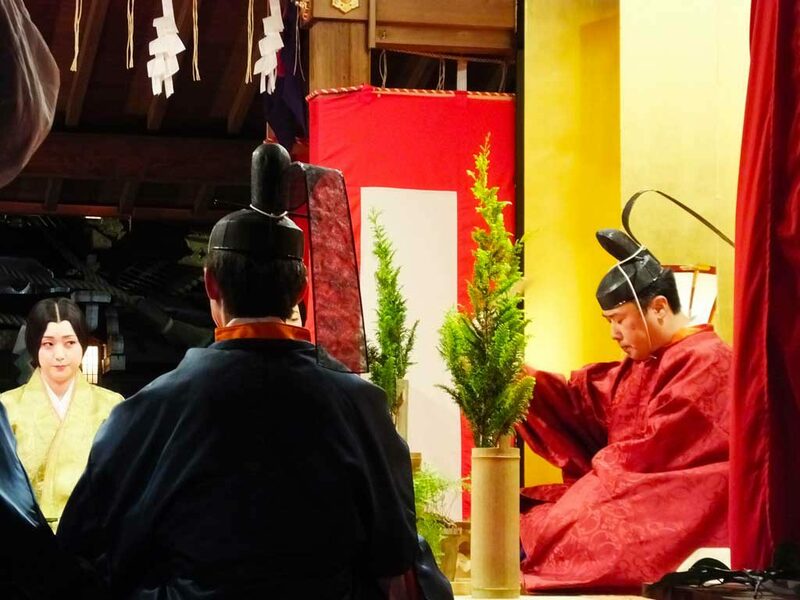 Otsuki no Gi starts at 5:30 p.m. A man exorcises evil spirits from people of the shrine and hoshi-nyobo. 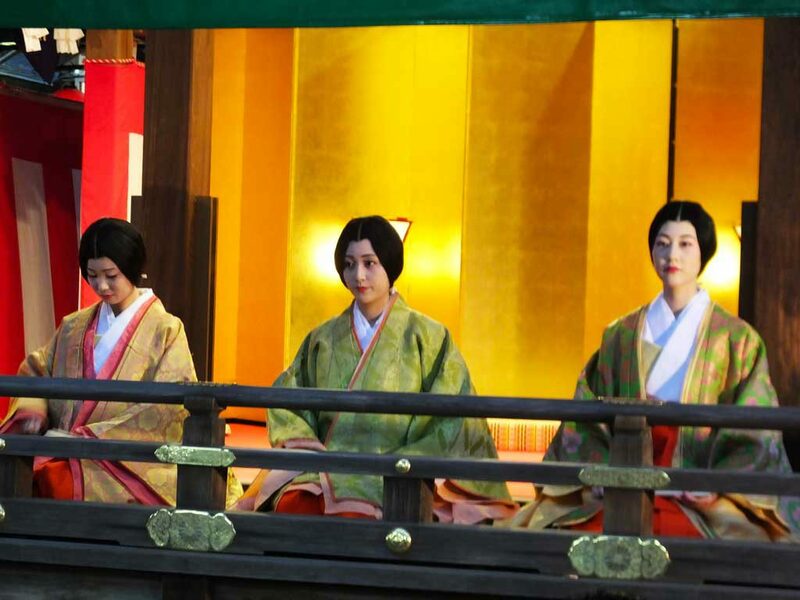 Now it is time to recreate the scene of Gencho no Shiki in the Heian Period. 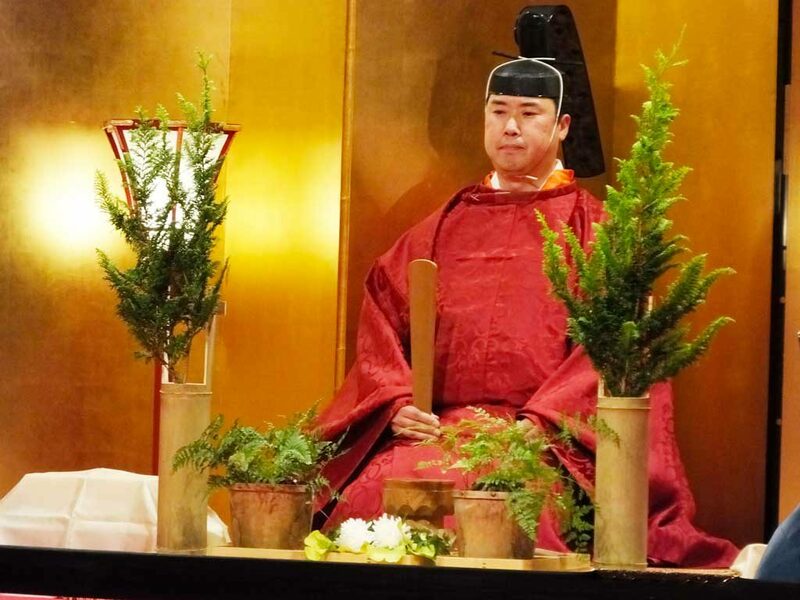 The chief priest of the shrine plays the role of the emperor, and acts as if he makes rice cakes. 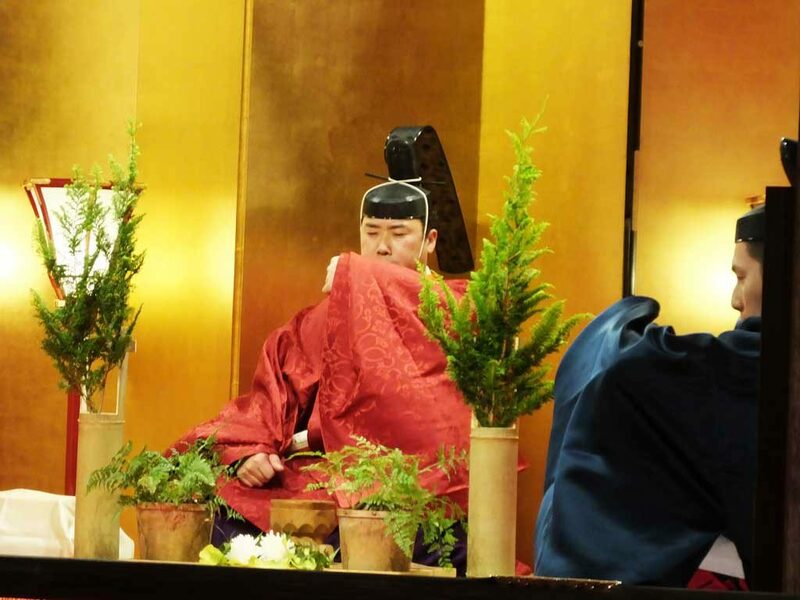 There are three colors of the rice cakes ―black, red and white because people in different social statuses received different colored rice cakes from the emperor at that time. 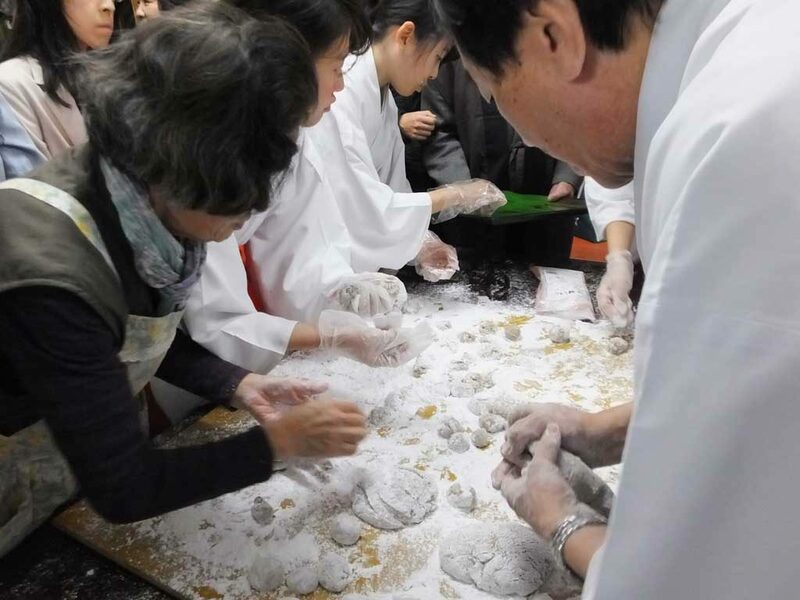 After that, the “emperor” starts to act as if to put glutinous rice flour in the mortar. 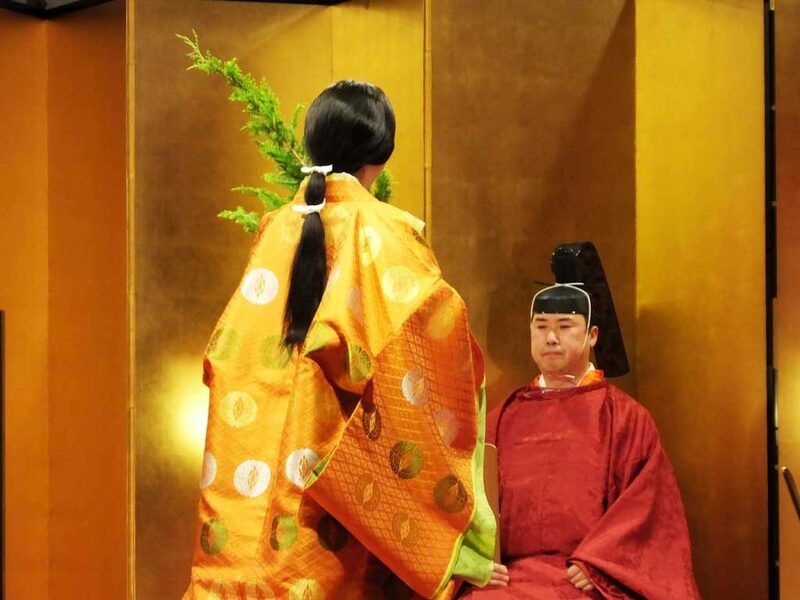 Then, two hoshi-nyobo act as if to pour water over it. Next, the “emperor” starts pounding it. 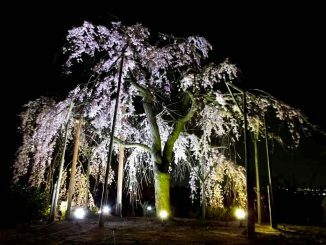 This is the highlight of Inoko Festival! When he finishes it, he hides his mouth with his sleeve and chants. Finally, he acts as if to take out the rice cake with chopsticks. 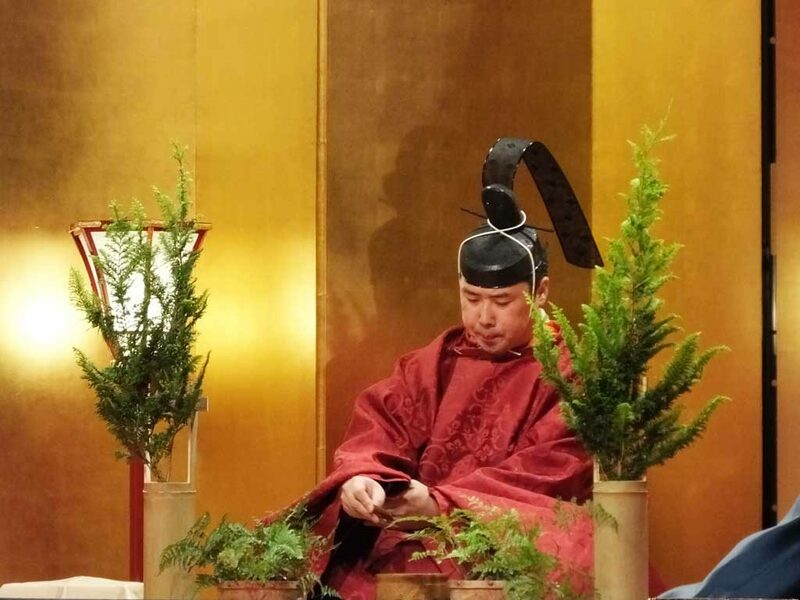 He repeats his actions two more times, but at the second time, it is hoshi-nyobo who chant, and at the third time, the “emperor” with “courtiers” and hoshi-nyobo chant by turns. 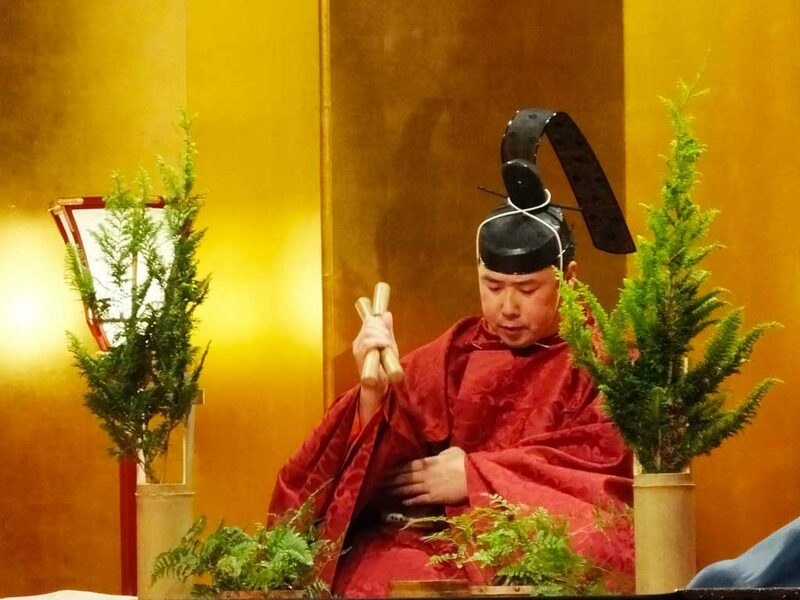 A part of the rice cake is offered to the deities of the shrine, Wake no Kiyomaro and Wake no Hiromushi. 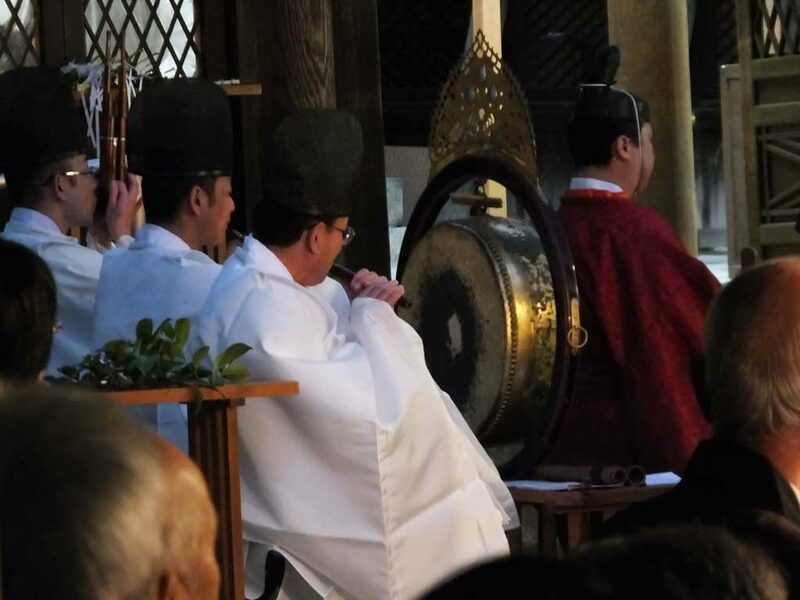 There is a small ritual at the main sanctuary. 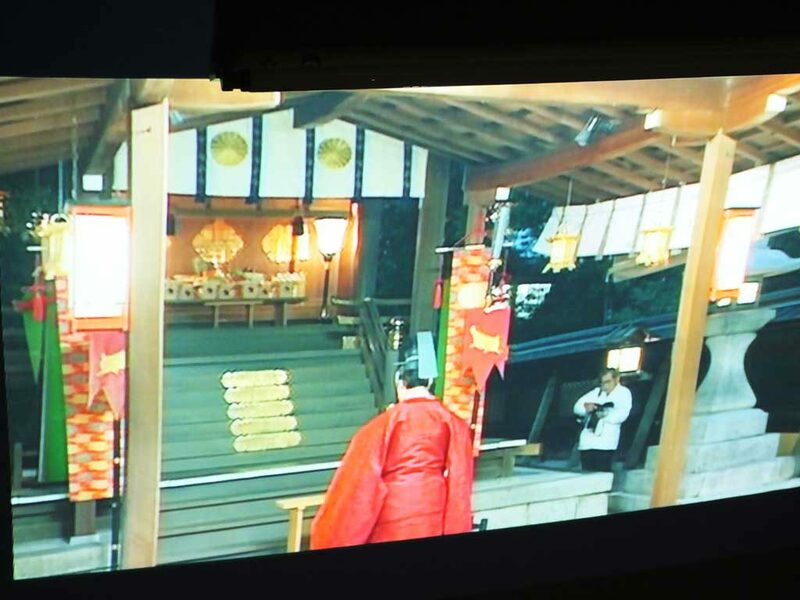 Visitors are not allowed to enter the area, but again, they can see the ritual on the screen. 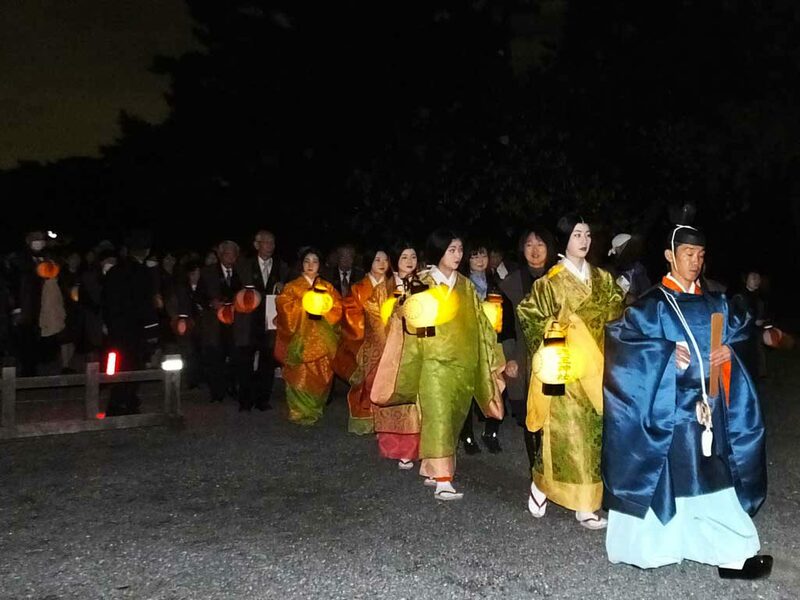 At 7:00 p.m, the lantern procession (Japanese: chochin gyoretsu) starts from the shrine. 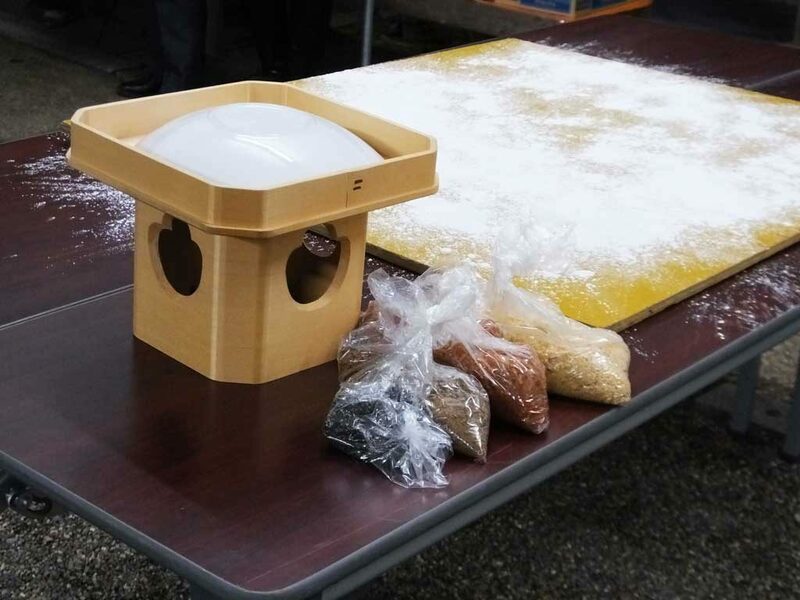 The rest of the rice cake is put in a portable chest and carried to Kyoto Imperial Palace. Those who applied to the procession can join it. 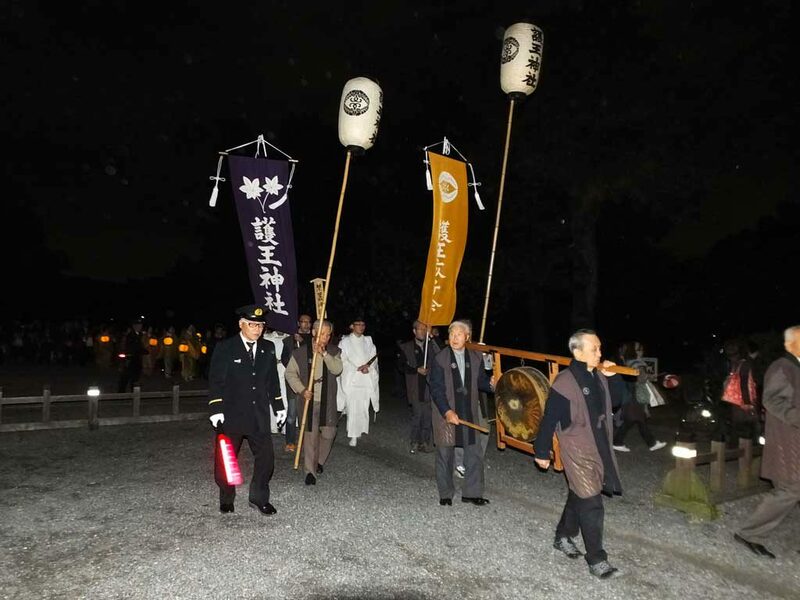 The procession goes through Hamaguri Gomon Gate and enters Kyoto Imperial Palace Park. 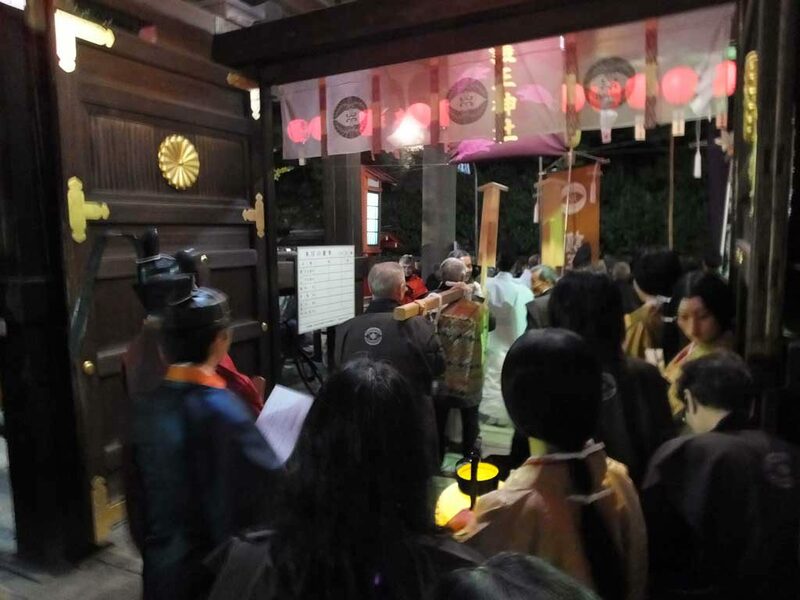 Only authorized people walk through Seisho-mon Gate and have a small ritual to offer the rice cake to a person of Imperial Household Agency. Other people wait at the gate and watch it. 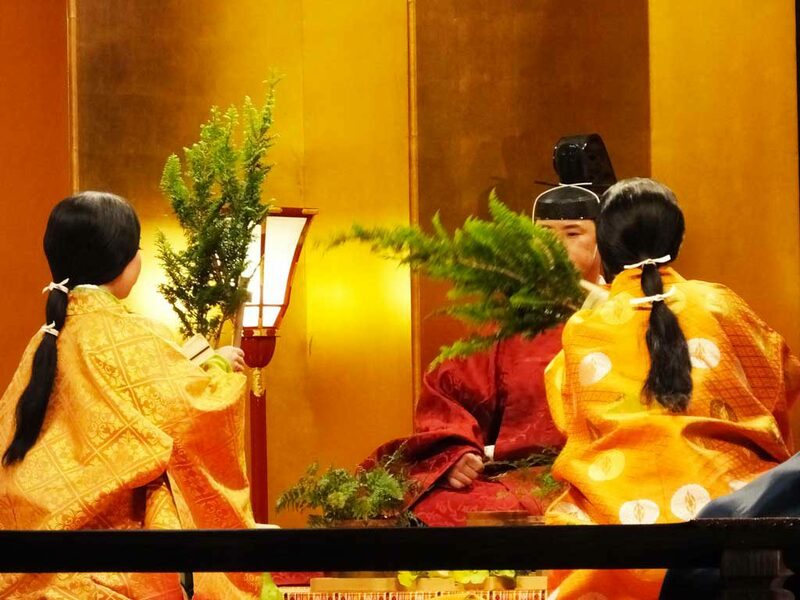 At the end of the ritual, all people including people at the gate say “ikuhisa” together, which is a word to celebrate the long reign of the emperor. 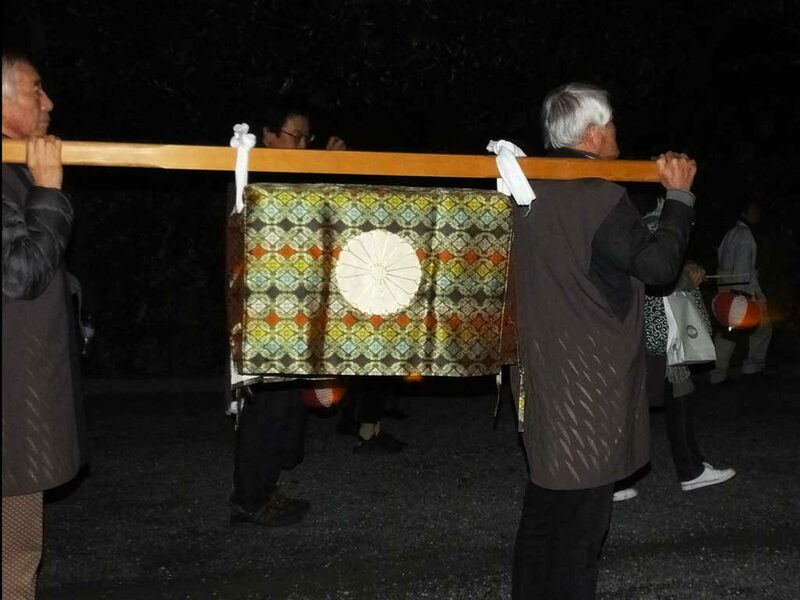 It is said that the model of this procession is people in Nose (in Osaka Prefecture) who made a procession to bring rice cakes with azuki beans to Kyoto Imperial Palace in the Ashikaga Period (1336―1573). They were wearing beautiful clothing and they had torches. 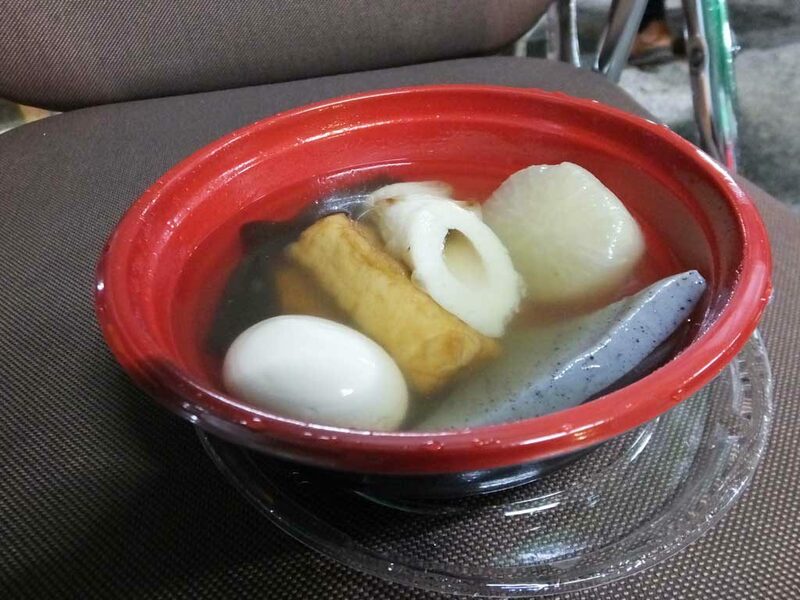 After the lantern procession, it is time to eat oden pot dish. Something gray in the bowl is called devil’s tongue or elephant yam (Japanese: konnyaku), and something with a hole in the middle is chikuwa that is made with fish paste. Have a try! 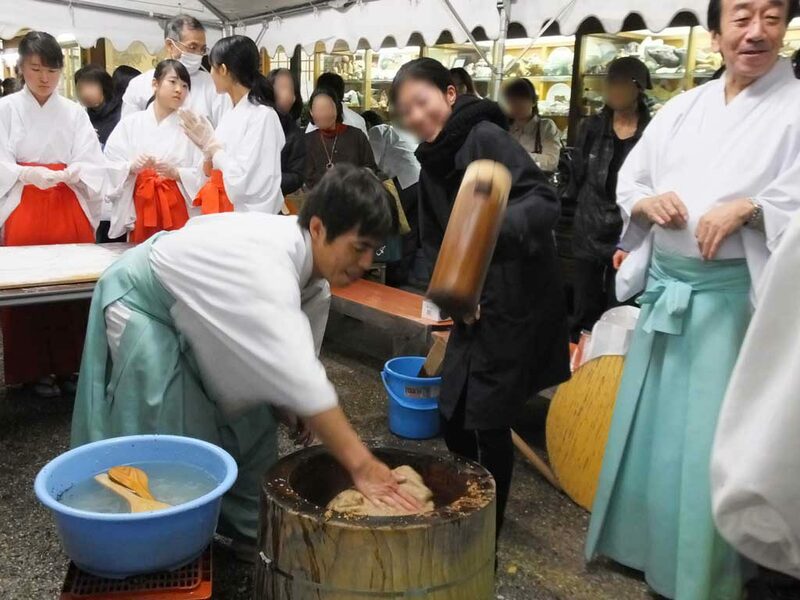 People of the shrine pound rice cake, singing a song, inoko-bayashi with people around them. The solemn atmosphere suddenly changed into a fun and friendly atmosphere. 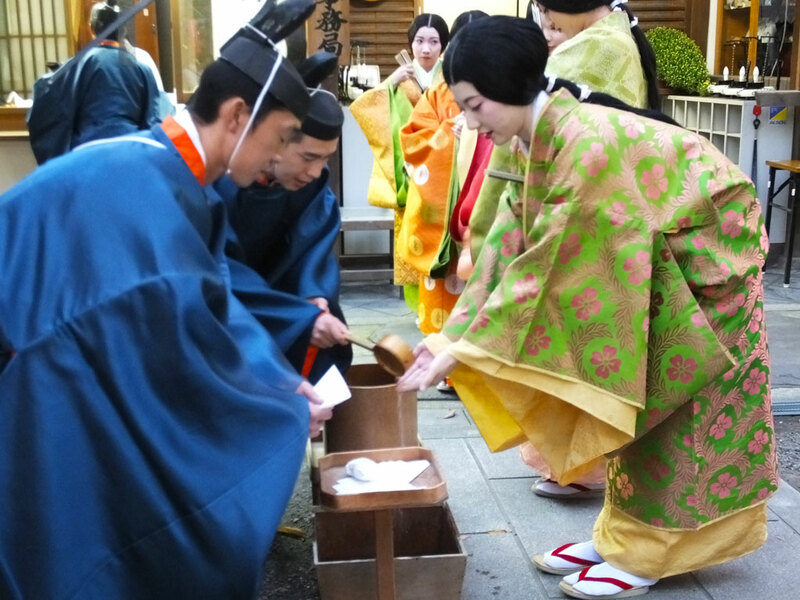 A part of the rice cake is offered to the deities of the shrine, and the rest of the rice cake is provided to people. 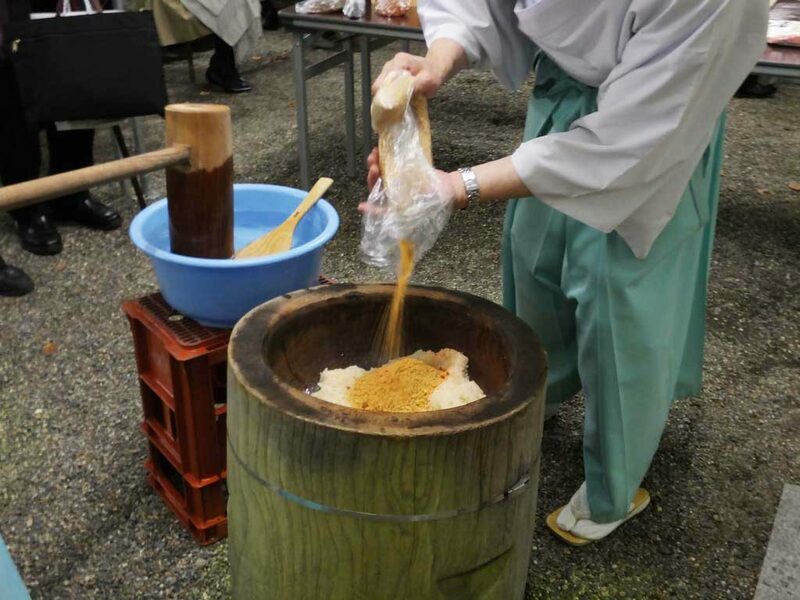 You can experience pounding the rice cake and eat it for free. Anyone can join it. When I went there, there were lots of people and I could eat only one piece, but I was very happy in the good atmosphere. The just-made rice cake was soft and really tasty. You can drink Japanese rice wine, sake, too. It ends around 20:30 p.m. 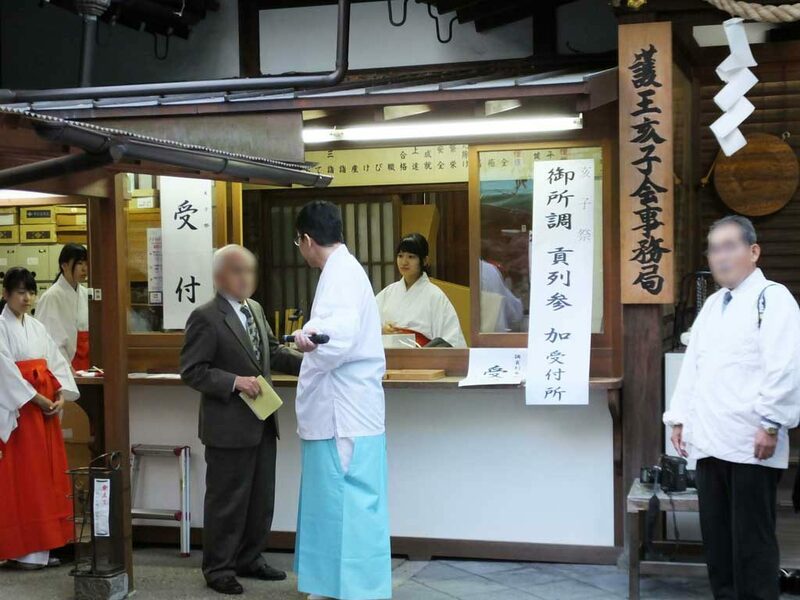 In the shrine, you can buy a box of rice cakes (inoko-mochi) from the famous Japanese sweet shop, Tsuruya Yoshinobu, too. They tasted a little different from what I received when I applied to the procession. In the picture, the left one is from Tsuruya Yoshinobu, and the right one is what I received before the rituals. I liked both. Actually, they are shaped like boars. 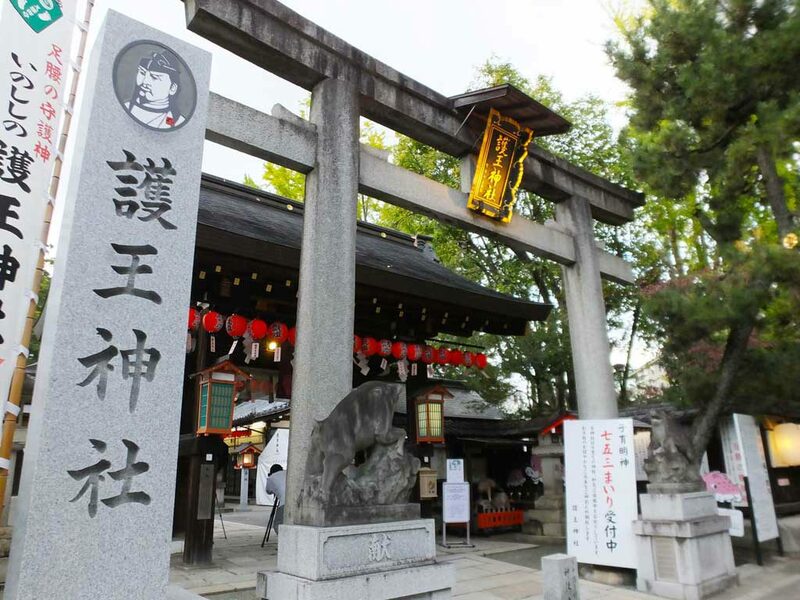 Go-o Shrine is a shrine of boars because it is said that when a deity of the shrine, Wake no Kiyomaro was attacked by killers, 300 boars suddenly appeared and saved him. 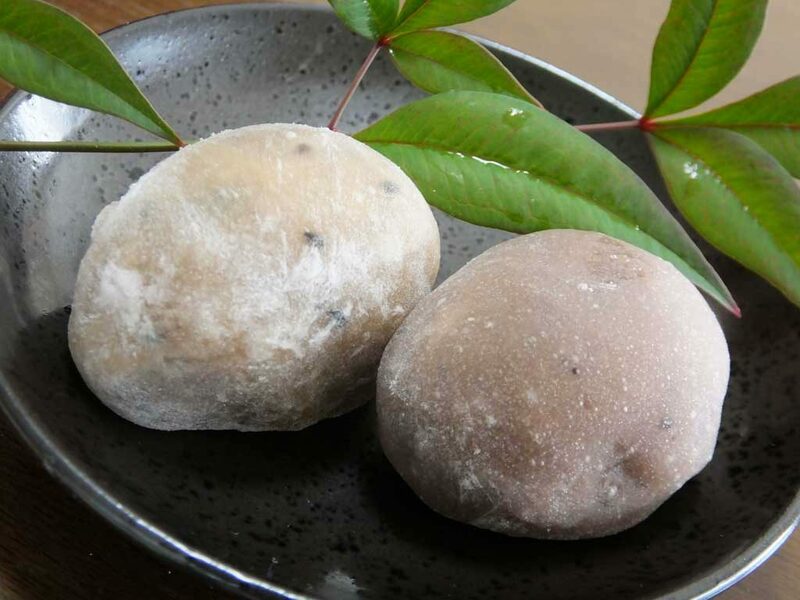 If you go to Inoko Festival and eat inoko-mochi, maybe you will stay healthy with the power of strong boars. 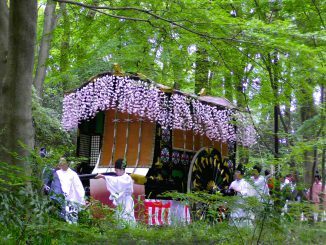 Inoko Festival Start 5:00 P.M.